Today, the U.S. submitted its blueprint for rolling back greenhouse gas emissions as part of a pledge to tackle a threat the Department of Defense said last fall will impact national security. The White House said it would work to cut emissions 26 to 28 percent by 2025, the goal it first laid out in its breakthrough deal with China announced earlier this year. China agreed to cap emissions by 2030. The U.S. is the second largest carbon emitter in the world, so this represents a major milestone on the path toward signing a formal world climate agreement in Paris later this year. But America's own environmental committee doesn't see it that way. 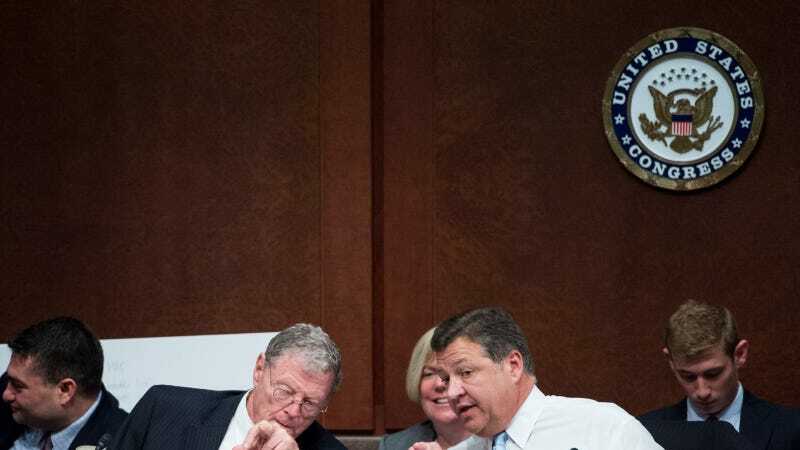 On Tuesday morning, Sen. James Inhofe, the chairman of the U.S. Senate Committee on Environment and Public Works, released a statement in which he vowed that the pledges would go nowhere. "When a treaty comes before the Senate, I fully expect for a majority of my colleagues to stand with the rest of Americans who want affordable energy and more economic opportunity, neither of which will be obtainable with the president's current climate deal." The administration, of course, is well aware of this attitude, which is why Sec. of State John Kerry is working with other world leaders to structure the Paris agreement so that it can bypass the Senate, according to the New York Times' Coral Davenport. For what it's worth, Sen. Barbara Boxer, the committee's minority leader, also released a statement praising the deal. "Today's announcement confirms that the United States is doing its part to reduce dangerous carbon pollution, and this effort will continue to bring other countries along the path to a strong agreement in Paris," she said.